It is ironic, or maybe just a tragedy, that the United Nations Intergovernmental Panel on Climate Change (IPCC) released its latest Special Report on Climate Change as the United States celebrates Christopher Columbus. After all, it was Columbus’ so-called “discovery” that set in motion the modern extractive economy that has led us to this point: killing indigenous peoples to steal their land and exploiting human labor for profit. Columbus’ trading routes were the foundation of the slave trade — leading to the first modern nation built by the hands of enslaved Africans. The extractive practices that Columbus set forth didn’t end at the Civil War. These practices reinvented themselves in the industrial age. The United States propped up the fossil fuel industry, which continued to displace people, extract resources from the land, and implement horrific labor practices. The roots of our extractive economy — genocide and slavery — remain the two sins we have never truly addressed to this day. Now we are facing judgment. The UN warns that we are on the brink of total climate catastrophe because of our extraction and burning of fossil fuels. Data from the report shows that if we don’t get off fossil fuels in the next twelve years, we should brace for a dystopian future. Droughts, worsening air, disease, vast economic inequality, dangerous storms, famine, wildfires, and power outages are just a glimpse of what is ahead. We already see this playing out locally. For example, in the majority-Black community of Nicetown, the childhood asthma rate is nearly four times the national average. As air quality worsens with climate change, the asthma hospitalization rates will spike. Yet, SEPTA is building a fossil fuel plant that will harm young Black lives — replicating the Columbus way. We are set to burn through more fossil fuels, but really we will burn through our children’s’ future. Making this picture even bleaker is a federal government that has ignored the science of climate change and doubled down on coal, gas, and oil. Despite the despair — we absolutely must have hope. At POWER, we are a people of faith. And faith is not just “thought and prayers” but actions, energy, and justice. And one thing that gives us hope is that we already have the answers to our climate problem. It comes in the form of energy democracy: where communities are the owners, leaders, innovators, and developers of our renewable energy resources. Energy Democracy is a fitting response to our current crisis because it is a direct challenge to the last 600 years of replicating Columbus’ practices. This is the solution we must get behind. This is the solution we need our elected officials here in Philadelphia to be driving home. Yes, we need emission reduction (they are critically important), but that fundamentally will only come about if we dismantle the pillars of our extractive energy economy. We must be about equity and justice if we want to succeed. Community members expressed a multitude of solutions that could make Philadelphia fossil-free sooner than later. These range from an exponential expansion of affordable housing that meets passive standards to rethinking how we heat our homes while protecting our labor workforce and community wellbeing. But there are three immediate actions that we can do right now. First, SEPTA must cease its development of a natural gas plant and instead support more solar development. 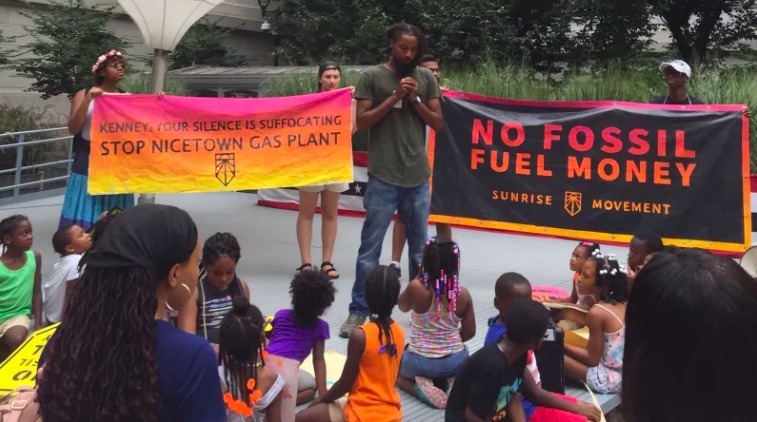 It may be small in the “emissions” game, but it has dire impacts on the Nicetown community. Saying no to the plant today means saying no to future gas plants tomorrow. Second, we must invest in the resilience of our schools, recreation centers, and libraries by creating community-owned renewable mini-grids that that can be heating, cooling, and emergency centers for people when the power is out. Third, we must demand that PECO procure 20% of its energy from local community-owned renewable resources by 2025 to help make our grid less dirty. All three could be made possible if our state leaders pass the newly proposed community-solar bill, introduced on the House floor just last week. The IPCC report reminds us of the urgency of impending climate disaster. But if we are serious in addressing it, we must undo the extractive economy that created it.